Dangerous Driving knows exactly what it is and what it wants to achieve. It’s an arcade-style racing game from some of the minds behind Burnout, where you can shunt opponents into walls, powerslide around corners at ridiculous speeds, and rarely let go of the boost. Dangerous Driving is, in many ways a game living in the past, taking much of its inspiration from a genre that has rarely evolved, or even released many new games, over the past decade. It’s also one of the most entertaining racing games I’ve had the pleasure of playing in years. Set amidst a diverse collection of national parks in the United States, Dangerous Driving is divided into distinct racing classes, each based on a particular car type. Starting out with Sedans, you’ll unlock more and more cars and classes by completing events, of which there are nine different kinds. Some, like Race, simply task you with racing against other drivers to see who can finish first, while others, such as Road Rage, have you competing to see how many cars you can destroy in a set amount of time. It’s a basic setup, and modes themselves are engaging and fun to play around in, but the real star of the show is the driving itself. When you hit the gas, you feel the speed and strength of your car in every straightaway you launch down and vehicle you take out. Three Fields Entertainment knows how to make each car you drive feel good, but not good in the sense that they’re realistic. Driving always feels a bit loose, a bit too defiant of the laws of physics, and it makes for very exciting races where you trade paint with a rival, narrowly avoiding the traffic making its way down a lonely stretch of highway. And because you gain boost by taking out your opponents and driving poorly, be it on the wrong side of the road or by narrowly missing cars, you’re going to be taking a lot of risks. I would continually push myself forward, risking that dangerous drift, all to increase my speed to ludicrous levels. The tracks themselves, of which there are over thirty, range from snowy forests that lie beside cold lakes to rocky canyons that twist and turn every couple of hundred feet. They’re a diverse lot, and even though you’ll end up racing the same courses again over the length of the game, they never get old. Levels are lovingly rendered, and the tracks themselves are challenging yet entirely fair in design. 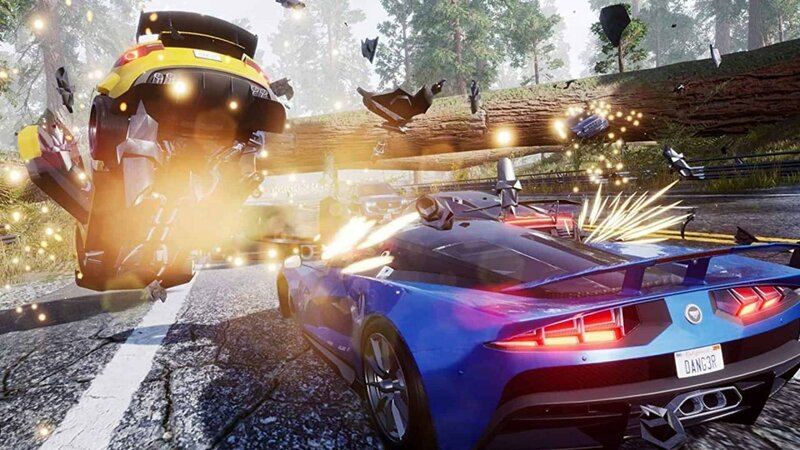 Coupled with the game modes, which can radically affect how you approach a given track, along with Dangerous Driving’s game-changing feature, and you have a well-designed set of courses that are always fun to speed through. The biggest addition to Dangerous Driving compared to Burnout is also its best. Those cars you take down in a race will stay on the track for every lap. You may be boosting down the road, sliding through a curve by awkwardly hitting the barrier, and all of a sudden you’ll crash because the car you took out to claim first place is still lying right near the spot where you took it out in lap one. While you may have been able to get by with pure aggression in Burnout, that’s often not the best course of action here. It’s a very tempting course of action, and one that I indulged in far too much, but the fact that I had to cull back on my aggressive tendencies and note where potential wrecks could lie meant that I had to pay more attention to the road and my driving techniques. In a way, I became a better driver through dealing with the persistent wrecks, and it’s a system that brings a lot to the table. Another major feature, so to speak, is the lack of a soundtrack apart from one song that plays in the main menu. Instead, Dangerous Driving comes with the ability to link your Spotify account to the game, so that you can listen to your own music and playlists while you play. Were you to not do this, all you would hear in the middle of a race is the roar of the engine and the sounds of cars crashing. First off, let me be the first to say that listening to the hits of Celine Dion does not make for a great soundtrack to listen to in a game where you are frequently driving over 200 miles an hour. Jokes aside, the biggest difference between linking Spotify to Dangerous Driving and merely listening to a Spotify playlist through your console or PC is that you can change your tracks or pause a song with a simple button press. 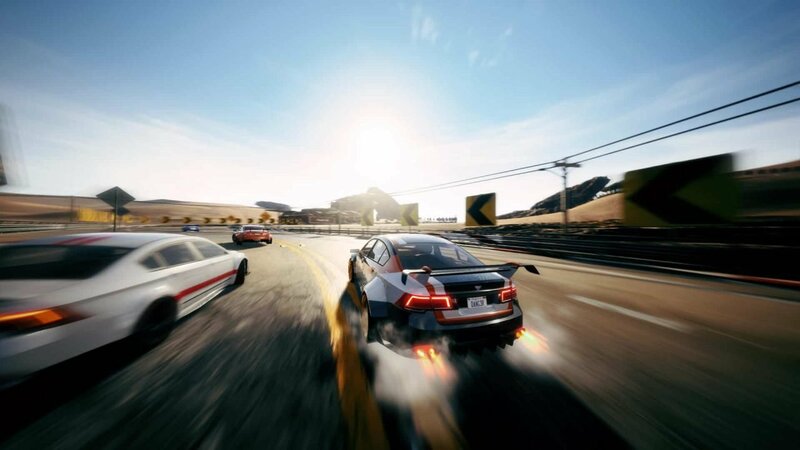 Some of the features you’ve might expect from similar racing games, such as pausing the track when you’re in a loading screen or slowing it down when you’re in a crash, aren’t present here. Apart from that, it’s a feature that mostly works, as I already enjoyed setting my own soundtrack in other racing games as opposed to listening to the included one. It’s also very intuitive, and apart from logging into a computer to set it up, track and playlist changes are easy to pull off. You’ll also need Spotify Premium in order to use this feature properly, and there is a 30-day free trial if you’re not a subscriber. Notably missing from the current state of the game is any form of multiplayer. Local multiplayer is nonexistent, and online multiplayer is set to arrive as free DLC shortly after launch. 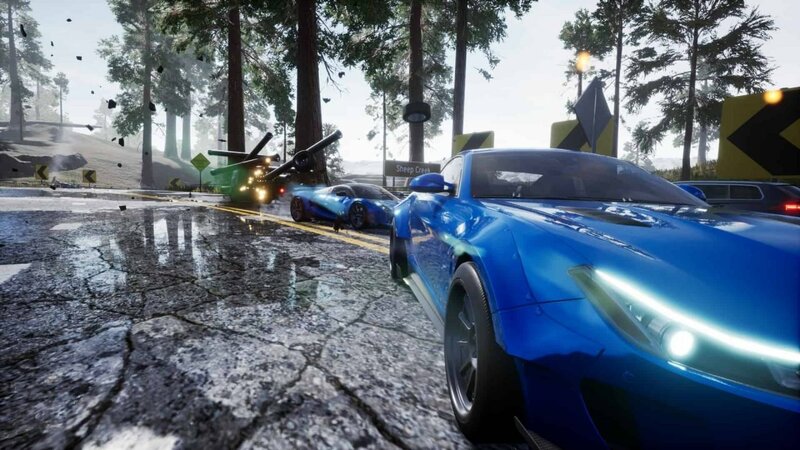 I would have much preferred that Dangerous Driving launched with it, but the base game is strong enough on its own that the absence of multiplayer isn’t anything more than a minor disappointment. Even beyond the copied modes and basic gameplay, Dangerous Driving wears its chief inspiration on its sleeve proudly. It’s difficult to talk about Dangerous Driving without comparing it to Burnout. 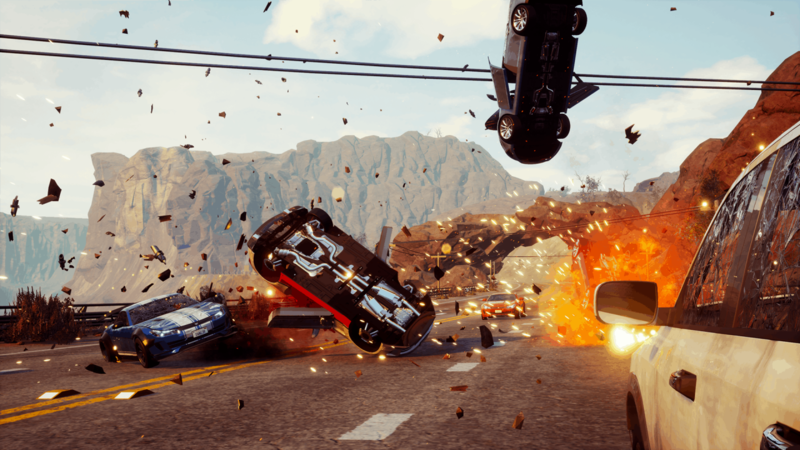 Not only is it developed by Three Fields, which was founded by former members of Criterion Games who worked on the Burnout franchise, Dangerous Driving evokes Burnout from the moment you the start menu. 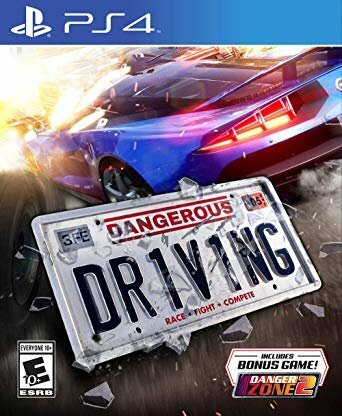 From the font to the design of the user interface, to the loading screens, to how the cars drop down from the ceiling as you select them, Dangerous Driving screams Burnout. It’s as if it has been pulled directly from Burnout 3: Takedown. With the lack of traffic-checking, which was introduced in Burnout Revenge, and the absence of an open world, Dangerous Driving feels like Burnout 3.5. And as someone who’s been looking for that kind of game for over a decade, it’s refreshing. This type of game is rarely made anymore, and those that have been released in the genre over the past few years have been mediocre at best, in my opinion. More realistic racing franchises like Forza still have a touch of liberal physics, but it’s not the same as what I’ve come to know and love. Though other arcade racing franchises exist, most notably Need for Speed, they never had the same appeal to me that Burnout did. Trust me when I say that if you like Burnout, you will love Dangerous Driving. And even if you’ve never played this style of game before, or you don’t know what to expect from this, Dangerous Driving is an excellent entry point. From the moment you activate boost for the first time, Dangerous Driving roars to life with a speed and vision that I’ve sorely missed. Dangerous Driving is a good game, one that brings a smile to my face every time I slam a rival into the median. Three Fields has created something special here, and I can’t wait to see how they’ll improve upon it in the future. Dangerous Driving is the arcade driving game I’ve been waiting years to play.